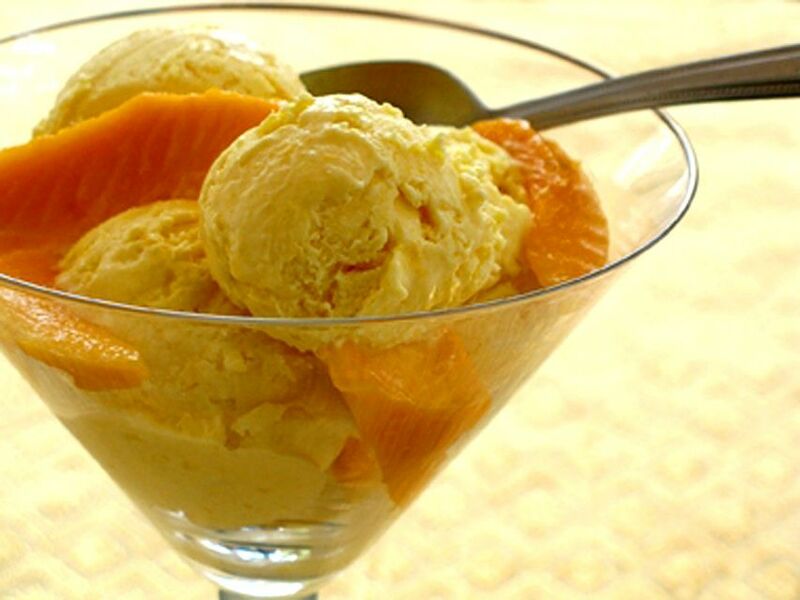 Try this fantastically easy recipe for mango ice cream as in Thailand! The texture of this frozen dessert is halfway between sorbet and ice cream, and full of mango flavor. Quick and simple to make too, because there's no stove involved - not even an ice-cream maker. All you need is a blender or food processor. Makes a beautiful dessert to serve company, and easy too, since you can make it well in advance. Delicious as is, or serve with slices of fresh mango or papaya and a little coconut rum/liqueur drizzled over the top. Slice the mangos open and scoop out fruit from the skins. Don't forget to include fruit around the stone. Place the fruit in a food processor or blender. Add the sugar and blitz for 1 minute, or until sugar has dissolved and you are left with a delicious mango puree. Add the coconut milk and lemon juice, and briefly blitz to combine (a few seconds). *At this point, you can perform an optional step - see below. *Optional Step*: Some people don't want bits of mango pieces or mango fiber in their ice cream. I actually like it, as I find it enhances the taste of the sorbet, plus it's healthy. But if you'd rather strain it out, here's how: Between steps 3 and 4, pour the mango puree through a strainer placed over a bowl. Use a spatula or wooden spoon to press the pulp against the bottom of the strainer in order to "wring out" every ounce of mango juice. Continue on with steps 4/5. Now pour the whipping cream into the processor/blender. Blitz until the cream forms stiff peaks, or is quite stiff (not runny) when dipped into with your finger. Add the mango puree to the whipped cream and blitz 5 to 10 seconds, or until you get a good mango-cream consistency. Pour into a large yogurt container or ice cream tub and set in the freezer for at least 6 hours, preferably 8.